What exactly is a super blood moon and when can you see it? File photo of a super blood moon. Those willing to risk a chilly evening and a late bedtime Sunday night will be met with a stunning reward - the only total lunar eclipse of 2019. And this one will be a super blood moon. What's a super blood moon? According to NASA's Jet Propulsion Laboratory, the moon will simultaneously be in the full moon phase of its orbit and reaching the perigee, the moon's closest position to Earth (about 363,300 kilometers, to be exact). This is why it appears much larger than a regular full moon, or "super." When the moon passes through Earth's shadow, it will turn a reddish color, hence the "blood" aspect of the name. While the moon hits the perigee and the full moon lunar phase in each of its orbits, they don't typically happen at the same time. Additionally, the Moon's slightly tilted orbit often keeps it from falling into the path of Earth's shadow, hence why lunar eclipses aren't frequent occurrences. An artist rendering of a lunar eclipse. 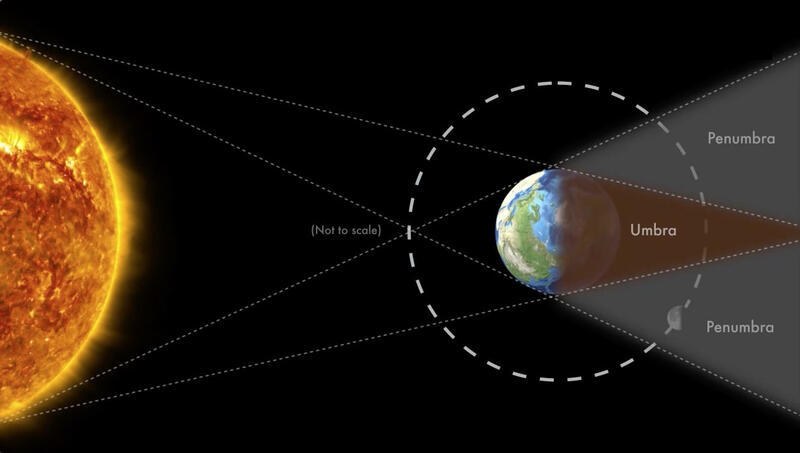 According to NASA, the lunar eclipse will begin at 9:36 p.m. EST, as the moon begins passing through Earth's cone-shaped shadow, called the penumbra. The shadow will be lighter at this point due to some penetration by sunlight. Around 10:33 p.m. EST, the moon will experience significant darkening as it enters the "umbra," and it might look like it has had a bite taken out of it. At 11:41 p.m. EST, the moon will fully be in the umbra, but the moment of the greatest eclipse will happen once it's halfway through the umbra at 12:12 a.m. EST. "As the Moon moves completely into the umbra, something interesting happens: The Moon begins to turn reddish-orange. The reason for this phenomenon? Earth’s atmosphere. As sunlight passes through it, the small molecules that make up our atmosphere scatter blue light, which is why the sky appears blue. This leaves behind mostly red light that bends, or refracts, into Earth’s shadow. We can see the red light during an eclipse as it falls onto the Moon in Earth’s shadow. This same effect is what gives sunrises and sunsets a reddish-orange color." The Moon will begin exiting the umbra around 12:43 a.m. EST, with the eclipse ending at 2:48 a.m. EST. Even with Michigan's unpredictable weather, there are still opportunities to watch this super blood moon in realtime. Head to timeanddate.com to watch the live stream. Our conversation with David Gerdes. He’s a professor of Astronomy at the University of Michigan. We're learning a lot about our tiny corner of the cosmos these days. That's thanks to improving technology and the increasing number of probes we're sending into the solar system. But as much as we learned so far, there’s still a lot about space that we don't know. University of Michigan astronomers recently came across a planetary surprise that might get us closer to that discovery. And it turns out Pluto might have a friend out there after all.